Mega Millions is a number lottery that is played in the United States of America. The historically biggest jackpot worldwide (as of 17 April 2014) was hit right in this game. The jackpot amounting to $656 million was split among three players. The players of Mega Millions pick 5 white balls out of 75 and 1 golden ball out of 15. They can use their own lucky numbers or automated easy pick. There are nine prizes in total, similarly as in another US lottery Powerball. The top prize is the jackpot, the other eight prizes are fixed. The minimum jackpot is $15 million, but it increases by at least $5 million per drawing (the state of rules as of 17 April 2014). The jackpot is won by one or more player(s) who match all 6 drawn numbers, that is 5 + 1. As for the other prizes they depend on how many white balls (out of 5) are hit by a player and whether or not the golden number is caught. The ticket costs $1. 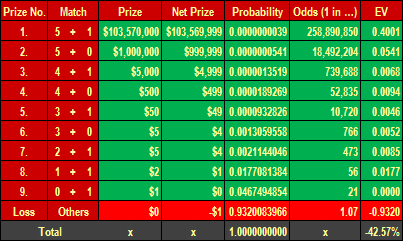 The odds of winning any of the nine prizes, and additional information, can be found in the Table 1 below. If you succeed to match 5 out of 5 drawn numbers (out of the total of 75 numbers or white balls) and 1 golden ball (out of 15 golden balls in total), then the jackpot is yours. If you only match 5 + 0, then you win the 2nd prize. The fixed prizes (no. 2 to 9) are taken from the Mega Millions operator web site (see the source under the Table 1). The jackpot as the top prize is floating, therefore—for the needs of our calculations (mainly of the player's expected average outcome)—we use its average value of about $103 million (source: lottostrategie.com, quoted 2014-04-17). 1 ÷ 258 890 850 = 0.00000000386263168435655. The probabilities of winning the other prizes in Mega Millions are also shown in the Table 1. If we add up all winning probabilities, we get the probability of winning at least something; that is approximately 0.068 or 1 in 14.7 (1 ÷ 0.068). On the other hand the probability of leaving empty-handed is the remainder to one (or 100%). Thus the probability of not winning anything in Mega Millions is 0.932 (93.2%) or 1:1.07. → The relation between odds and probability. Let us add that you can also pay $1 more for so called Megaplier that multiplies the fixed prizes. We know the probabilities of winning as well as the prizes that can be won. We also know the probability of losing $1 per a ticket. The column Net Prize considers the initial $1 bet. If we multiply the net prizes and the loss of the $1 bet by the probabilities of winning and losing, we will arrive at the (partial) so called expected values (EV). By adding up the partial EVs we get the expected value -0.4257 or -42.57%. It shows the expected average outcome of the long-term betting of the Mega Millions lottery. It means that, in the long run, the player loses in average about 43 cents on each dollar invested in the game. That is the margin of the operator of Mega Millions. It always holds true that player’s loss is house’s gain and vice versa. So if the expected value of the player is negative, then the expected value of the lottery company (or casino or house in general) is positive. Winners can choose two ways of being paid out: cash option or annuity option. The first case is a one-time payment, but subject to federal 35% tax. The annuity option consists of one immediate payment followed by 29 annual payments, while each payment is 5% bigger than the previous one. The payments used to be equal. According to the company the players demanded this way in order to cover increasing costs of living. Source: Mega Millions (the original Czech article).